How do I allocate more memory to my Minecraft launcher client-side? Help! My client is crashing whenever I try to start it up or connect to my server! This commonly occurs when you do not have enough memory allocated to your game. Sufficient memory allocation is especially important when it comes to modded gameplay due to the resource demand they require. Fortunately, most launchers only require a few steps to adjust this. So long as you have the memory space available on the computer you are using to play, you should be good to go once you've made the adjustment. For modded gameplay, a minimum of 4GB/4096MB is recommended. More recent versions of Minecraft may demand a bit more, so you might consider 6GB if you're trying a 1.13+ pack. CubedHost is not directly affiliated with any of these launchers in any way. This guide is here only to help you enjoy Minecraft and connect to your server. Launchers can change at any time. We will do our best to keep this guide updated but please note that some directions may vary over time pending changes to the launchers. If you ever need help, please reach out to our team! Want to start your own Minecraft server? We offer Minecraft servers with hardware explicitly selected with Minecraft performance in mind so you can have the best possible experience. All of our servers include multi-gigabit DDoS protection and a 99.9% uptime guarantee so you can keep on mining. Our support team is the best around, doing all we can to help you. Start a server today and get 50% off your first month! So how do I allocate more memory to my launcher? We've included directions for several launchers below and we'll continue to add new launchers upon request, so feel free to reach out to us if you get stuck or have concerns with any steps you see here. Open your Minecraft client (Java version). Go to the Launch options tab and enable the Advanced Settings option. Select your Minecraft profile, enable the JVM arguments toggle and change -Xmx1G to -Xmx#G , replace # with the amount of RAM you'd like to allocate to Minecraft in GB (do not modify any other text). Select the Save button to save your changes. 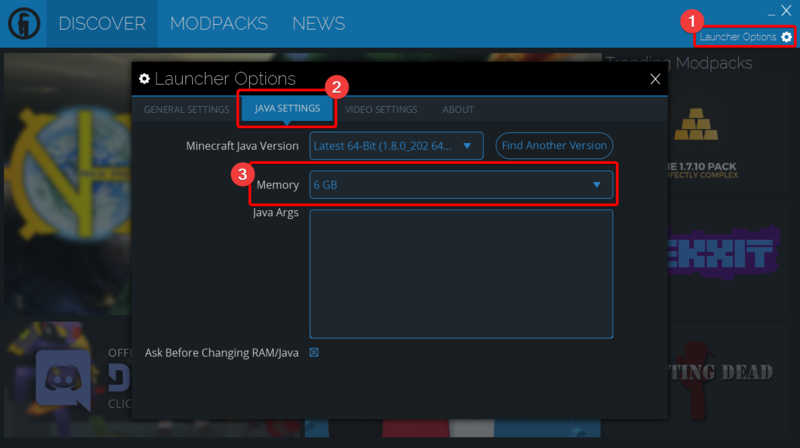 Open your ATLauncher, select the Settings tab from the right-side menu pane, then select the Java/Minecraft tab from the top navigation bar. You should now see drop-down menus available regarding memory. Adjust the Maximum Memory/RAM drop-down selection to your desired memory amount (remember that at least 4096 MB is recommended). Don't forget to select the Save button once you're done! To adjust this setting in the Twitch Launcher, access your settings by selecting the small down arrow in the top-right, then select the Settings option with the gear icon. 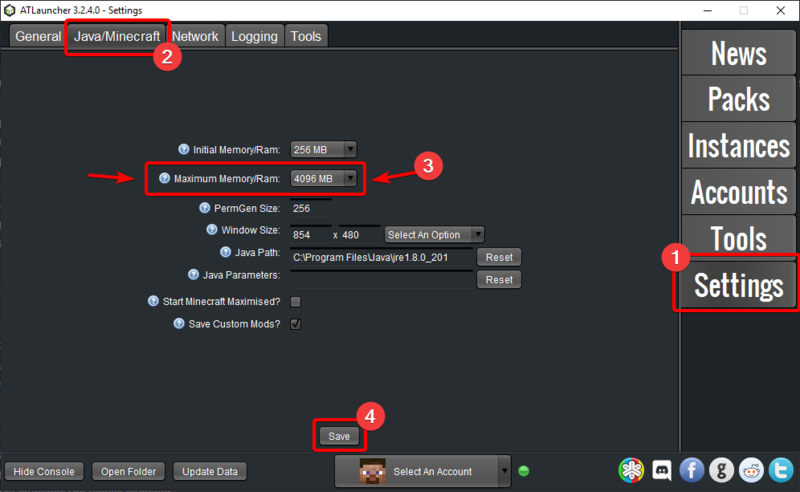 Next, select the Minecraft tab on the Settings page and locate the Allocated Memory slider under Java Settings. Adjust the slider to your desired memory amount (remember we recommend at least 4096MB). Open your Technic Launcher, select the Launcher Settings using the little gear found in the top-right, then select the Java Settings tab from the navigation bar in the Java Settings window. You should now see a drop-down menu available to adjust Memory. Adjust this to your desired memory amount (remember that at least 4GB is recommended). Your changes are saved automatically, so feel free to close the Launcher Options window and get to mining! Select Options, then move the RAM Maximum (MB) slider around to your desired memory amount (remember, we suggest at least 4096MB). 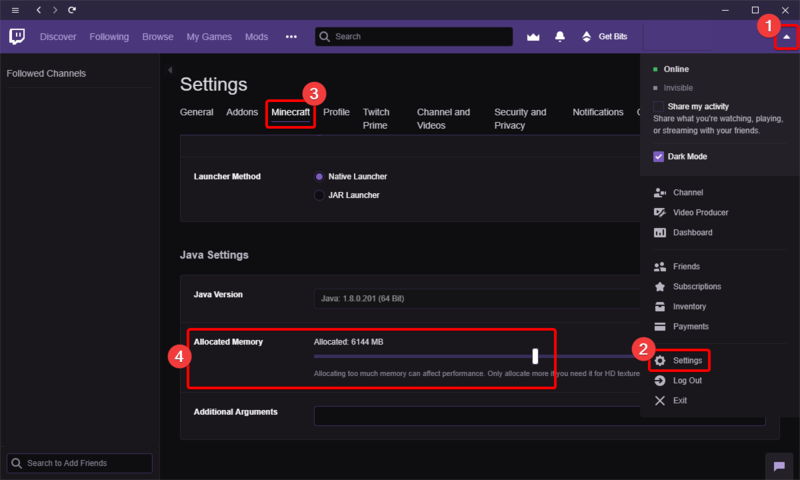 Select the gear in the top-right corner, change the Max: under the Minecraft: Options to increase the amount of RAM (remember, we suggest at least 4096MB).